The concept of the three orders for society is not something you find in the Bible, or in classical sources. The closest thing that to it comes from the seventh-century encyclopedia writer Isidore of Seville, who makes a short reference to the Romans having divided themselves into three groups: senators, soldiers and plebeians. I wished for tools and resources for the task that I was commanded to accomplish, which was that I should virtuously and worthily guide and direct the authority which was entrusted to me. You know of course that no-one can make known any skill, nor direct and guide any enterprise, without tools and resources; a man cannot work on any enterprise without resources. In the case of the king, the resources and tools with which to rule are that he have his land fully manned; he must have praying men, fighting men and working men. You know also that without these tools no king may make his ability known. Another aspect of his resources is that he must have the means of support for his tools, the three classes of men. Alfred’s formula is descriptive rather than prescriptive. He is not instructing the three orders in their duties, he is doing the reverse; he is meditating on his own duty to the effect that it is incumbent upon the king to ensure the three orders have the wherewithal they need to fulfil their functions. Alfred does not dwell on the theme; he mentions it as an aside. The point of the passage is not social commentary but a reflection on how he, King Alfred, should exercise his talents to ensure that his memory not be forgotten. While some wage war and others till the soil, you are that third order whose members he has appointed to a private duty, so that the less encumbered you are with worldly things, the more you are able to devote yourselves to the duties of his service. As the others endure on your behalf the hard conditions of war and toil, so you are beholden to them, continuing steadfastly to give them the unfailing service of your prayers and office. Know, however, that in this world three orders are established. These are laboratores, oratores, bellatores. Laboratores are those that labour for our sustenance. Oratores are those who intercede for us with God. Bellatores are those who protect our towns and defend our soil against the invading army. Now the farmer labours for our food and the warrior must fight against our enemies and the servant of God must continually pray for us and fight spiritually against the unseen foes. It is therefore a mighty fight the monks wage against the unseen devils who plot against us while men of this world fight with worldly weapons against earthly foes. Now earthly warriors should not compel the servants of God to earthly warfare away from the spiritual war, because their service is greater, the unseen enemies are greater than the seen, and it is a great hurt that they forsake the Lord’s service and divert to the worldly warfare that is not their concern. Every just throne that stands fully as it should stands on three pillars: first, those who pray; second those who labour; and third, those who fight. Those who pray are clergy, who must serve God and fervently plead for all people day and night. Those who labour are the workers who must toil for that by which the entire community may live. Those who fight are the warriors who must protect the land by waging war with weapons. On these three pillars must each throne rightly stand in a Christian polity. If any of them weaken, immediately the throne will tremble; and if any of them fracture, then the throne will crumble to pieces, and that will bring the people all to ruin. Therefore, they are to be diligently steadied, strengthened, and reinforced with God’s wise teachings and with just worldly law; in that way they will bring last guidance to the people. And what I say is true: if Christian faith weakens the kingdom will soon fall; and if injustice is exalted anywhere in the land or evil customs anywhere too eagerly embraced, the people will be brought entirely to ruin. Instead, one must do what is need to suppress injustice and exalt the law of God; that may be of need before God and the world. Amen. The community of the faithful is a single body, but the condition of society is threefold in order. For human law distinguishes two classes. Nobles and serfs, indeed, are not governed by the same ordinance…. The former are the warriors and the protectors of the churches. They are the defenders of the people, of both great and small, in short, of everyone, and at the same time they ensure their own safety. The other class is that of the serfs. This luckless breed possesses nothing except at the cost of its own labour. Who could, reckoning with an abacus, add up the sum of the cares with which the peasants are occupied, of their journeys on foot, of their hard labours? The serfs provide money, clothes, and food, for the rest; no free man could exist without serfs. Is there a task to be done? Does anyone want to put himself out? We see kings and prelates make themselves the serfs of their serfs; the master, who claims to feed his serf, is fed by him. And the serf never sees an end to his tears and his sighs. God’s house, which we think of as one, is thus divided into three; some pray, others fight, and yet others work. The three groups, which coexist, cannot bear to be separated; the services rendered by one are a precondition for the labours of the two others; each in his turn takes it upon himself to relieve the whole. Thus the threefold assembly is none the less united, and it is thus that law has been able to triumph, and that the world has been able to enjoy peace. During the eleventh and twelfth other medieval scholars would add to this idea, and it gradually became a more solidified ideal, especially in France, where the three-estate system lasted until the French Revolution. Many historians, such as Georges Duby, have written extensively about the concept and how it moulded medieval society. 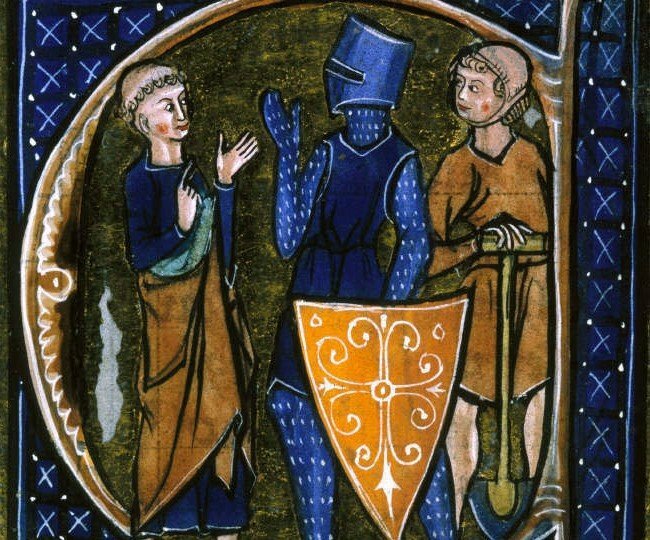 Even today, the idea of ‘Those who pray, those who work, those who fight’ remains one of the lasting notions of what we think the Middle Ages was like.